Narendra Modi, the controversial Hindu nationalist leader, has promised “good days are coming” in his first reaction to a historic victory by his Bharatiya Janata Party in national elections. As early official indications of results emerged from the largest election in history, Mr Modi’s BJP was leading in 277 of India’s 543 constituencies, while the Congress Party appeared to have been routed with its leader Rahul Gandhi at risk of losing his seat. Unofficial forecasts from India’s television news channels indicated his wider National Democratic Alliance had already won a clear majority with 315 seats, with the BJP alone winning 271 seats – one short of an absolute majority without the support of its coalition allies. “India has won. Good days are coming,” Mr Modi wrote on Twitter shortly before he went to seek blessings from his mother in his home state of Gujarat. 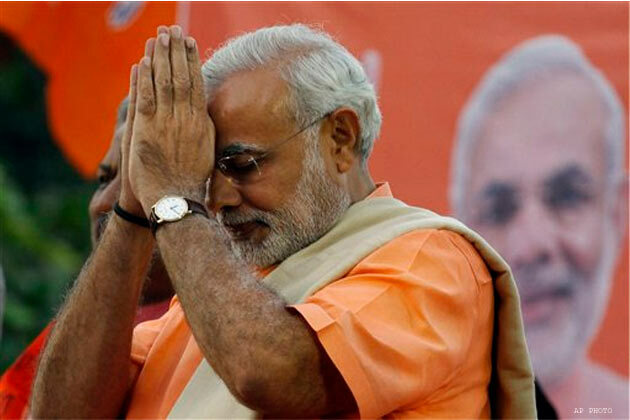 Television channels aired footage of an emotional Mr Modi meeting his mother and touching her feet, a traditional gesture when Hindus seek the blessings of an older relative. His mother then marked his forehead with vermilion and fed him sweets. Supporters of Mr Modi danced, sang and fed each other sweets on Friday as celebrations erupted throughout India over his almost certain thumping victory in the country’s general elections. “In the history of independent India, no political party has defeated the Congress party with such a wide margin,” Singh told a news conference that opened with the blowing of a conch shell, a traditional start for most Hindu rituals. Crowds roared “Hail Modi, hail Modi!” outside his party’s headquarters in Ahmedabad, the biggest city in the thriving state of Gujarat which the Hindu nationalist hardliner has steered as chief minister since 2001. The scale of its victory in states like Uttar Pradesh, where the BJP presence has been weak for more than a decade, the party is leading in 56 constituencies, while Congress was heading for just three seats from India’s largest state. Regional parties in the state, which the Congress had hoped might back a “Third Front” coalition to keep Mr Modi from power were leading in only 15 seats. In Maharashtra, the BJP and its Shiv Sena allies were set for victory in 30 seats while the Congress and its partners were ahead in just six. In states where the BJP is in power at state level, like Rajasthan, the party looked set to win every seat. In Madhya Pradesh it is ahead in 26 of 29 seats. In Bihar, where the Congress had hoped its local ally would win a majority of seats, the BJP and its partner is leading in half the constituencies. Both official indications from the Election Commission and the greater number of seats predicted by the television channels suggest exit polls had correctly predicted a landslide for the BJP’s National Democratic Alliance. In previous elections exit polls have been wildly inaccurate. There were scenes of celebration outside the BJP’s New Delhi election headquarters where party workers set off fireworks and fed each other with ladoo sweets to mark their expected victory. Hiraben Modi, Mr Modi’s elderly mother, paid tribute to his victory and said he “has my blessings” and said his win would mean greater development. India’s Sensex stock exchanged surged above 25,000 reflecting wide support for a strong Modi-led government among the country’s leading companies and investors. Mr Modi has pledged to strengthen decision making, boost investment in industry and infrastructure. Congress leader Rajiv Shukla said the party had expected to win more than a 100 seats but the scale of its defeat was a major disappointment. “We were not expecting these initial trends, it’s a source of disappointment …it’s a matter of great concern for us”, he said but pledged the party will bounce back. The Congress Party sought to shield its campaign leader Mr Gandhi for its worst ever election result and said it had been a “collective failure.” Party workers outside their headquarters however chanted his sister Priyanka’s name – she had earlier been tipped as a future party leader in the event of a humiliating defeat. BJP leader Balbir Punj said Mr Gandhi had waged a campaign of hate and fear against his party which had backfired. “They did not tell people what they had done over the last ten years because they had nothing to show. All they said was if BJP comes it will eat you alive”, he said. 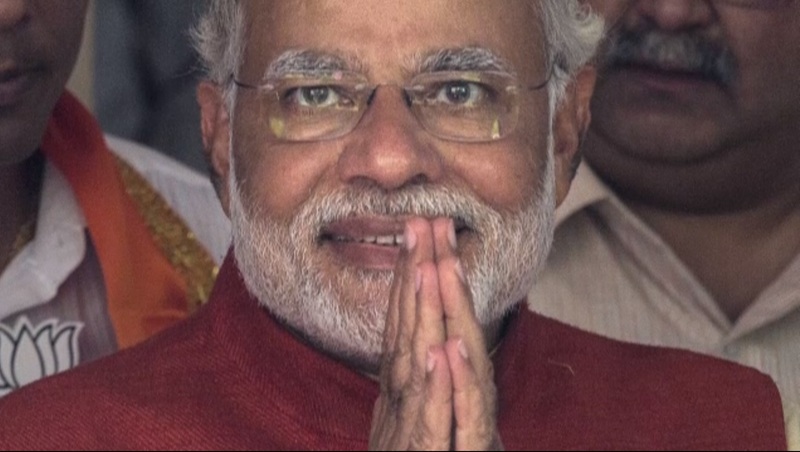 Mr Modi had won by campaigning on the “politics of hope and aspiration”, he added. The Congress party attempted to position its 43-year-old leader, Rahul Gandhi, as youthful and capable of boosting the country’s struggling economy. But many Indians see him as being out of touch with reality. His privileged background has made him appear aloof and removed from the concerns of most people. In comparison, Modi’s campaign was seen by many as a media and marketing coup for a man whose background ties him to bloodshed in his home state of Gujarat, where communal rioting in 2002 left more than 1,000 Muslims dead . Modi is accused of doing little to stop the rampage, though he denies any wrongdoing and has never been charged with a crime , In the Hindu dominated Country , where Muslims are in Minority . Modi was born on 17 September 1950 to a family of grocers belonging to backward Ghanchi-Teli (oil-presser) community, in Vadnagar in Mehsana district of what was then Bombay Presidency (present-day Gujarat), India He was the third of six children born to Damodardas Mulchand Modi and his wife, Heeraben. He helped his father sell tea at Vadnagar Railway station when a child and as a teenager he ran a tea stall with his brother near a bus terminus. He completed his schooling in Vadnagar, where a teacher described him as being an average student, but a keen debater who had an interest in theatre. That interest has influenced how he now projects himself in politics. He then worked in the staff canteen of Gujarat State Road Transport Corporation until he became a full–time pracharak (propagandist) of the RSS ( Extremist Hindu Nationalist Party ) in 1970. He had been involved with the RSS as a volunteer from the age of eight and had come into contact with Vasant Gajendragadkar and Nathalal Jaghda, leaders of the Jan Sangh who later founded the BJP’s Gujarat state unit. After Modi had received some RSS training in Nagpur, which was a prerequisite for taking up an official position in the Sangh Parivar, he was given charge of Sangh’s student wing, Akhil Bharatiya Vidyarthi Parishad, in Gujarat. Modi organised agitations and covert distribution of Sangh’s pamphlets during the Emergency. Modi graduated with an extramural degree through Distance Education in political science from Delhi University. Modi remained apracharak in the RSS while he completed his Master’s degree in political science from Gujarat University. This entry was posted in Asia Pacific and tagged BJP, Indian Elections 2014, landslide victory, Narendra Modi. Bookmark the permalink.